I bought my first eyeshadow “brush” 15 years ago, it was a sponge type applicator from Body Shop, really huge, it was excellent for applying a base color all over the lid, actually it was the only thing I was doing at the time, one shadow and that was all. After some time, when this “brush” got really old and when I wanted to repurchase it, it wasn’t sold anymore. Since I could not find it anymore, I kept on using the sponge type applicators that were delivered with the palettes. My first real eyeshadow brush purchase was the Mac 239 and my interest for brushes only started there. Today my Mac 239 meets the Shu Uemura 10 natural, two extremely good eyeshadow brushes that deserve all our attention. When you look at the Shu Uemura brushes, the first thing that comes to your mind is : “different” and then, “expensive” !!! I am very happy to have a few Shu Uemura brushes and I will try to give you my honest opinion on the ones I own. I start with this one since it’s the first Shu Uemura eyeshadow brush that I bought and although I managed to get it half price, it still was very expensive. Either way, I love it and I need it. I can get the same result, or very very close with a different brush but I will not get the same satisfaction. I have tried to find a dupe (or very similar) to this but there isn’t one. There is something special about it that makes it an “100% achieved” brush, you don’t need to add anything else to this brush for it to be better, well, you could change the handle, make it specially designed for you or change the ergonomics if there is a way to improve that for you, but in terms or how it feels, how it works, it’s perfection and to me it’s also perfectly well balanced. We all have our own preferences, it might be too big for some of you and if you don’t need such a big brush you may just skip it and forget about it. If you can work with such a big brush and you are looking for a base brush application or an all-over shadow application, this brush is a very good option. It picks a great amount of product, no fall outs, flawless and even application, it works with any type of product, powder or cream. In comparison, the Hakuhodo S120 (only available in Japan), is more flexible, thinner, has longer hair, not as densely packed but since it’s full kolinsky it would be insanely expensive to have it more densely packed. The Chikuhodo 12-3 is also full kolinsky, is even longer and wider which makes it slightly too big for me although I can still use it, it’s not as dense as the Shu 12 and is fluffier which makes it a big less easy to control and less good for precise application but has good blending capabilities. The Hakuhodo is also a fantastic brush and delivers a fantastic result, all are very soft but I still prefer the Shu, the densily packed layers of hair give this brush the final achieved perfection. Although you can totally live without it, this brush falls in the category “most expensive brushes that are worth having”. This brush has really good reviews in the blog world, I wonder why I waited so long before getting it. In terms of quality and efficiency, it’s excellent, you will love it, it really is the little sister of the #12, same quality, same finish although the #12 seems to be slightly more densely packed. In terms of packing and placing the color on the lid I love it but I prefer the Mac 239 since I can place more quantity, more precisely on my lid, the Mac 239 has also a flatter surface which allows me to apply and blend a bit more quick and easily. The Shu 10 is very soft yet firm and like the #12, it feels really luxurious on the lids, it’s also quite firm and picks a great quantity of product. I have to say that even though the Shu 10 and the Mac 239 are both extremely efficient, if I really had to pick one, I would keep my Mac 239. The Hakuhodo Kokutan WS looks a bit similar but it’s made of weasel hair, the reason why I got this one is because I use many cream eyeshadows (and Mac paintpots) and the Kokutan WS is small enough for me to place the cream shadow precisely close to the lash line and blend upwards. Both the Shu 10 and the Kokutan WS can be used with powder or cream products which is actually why I love them so much, very versatile. The Mac 239 is of course also appropriate with any texture. This is such a unique brush, you won’t find anything like it. What you will get : a different brush with very good quality. What you won’t get : precision on smallest zones (crease for example). It took me a while before I could use this brush properly, I was trying to achieve some kind of precise eyeshadow crease or outer v application, that’s not really where it excels, it does the job really well but not precisely (it is big and it covers too much surface for that purpose). 1) blending your crease color and bringing it near the browbone area, a sort of crease-to-browbone blending, it will softly move your skin around in the blending process since the bristles are firm but it will not hurt and is actually very pleasant to use. Great quality sable hair, absolutely light years apart from the Claudio Riaz that I tried a few months ago. 2) contouring : oh yes. For small zones (nose) or cheekbones and it will do it in a very subtle and efficient way, no streaky lines but you have to tap the excess off otherwise the application will be too heavy, better to slowly build up otherwise if you have to blend too much you might alter your foundation application. 3) highlighting : definitely. This is where I really love this brush, holding it the pointed size up, I placed the highlight on the cupid’s bow and blended towards the sides, I really (really) loved it, it diffused the highlight so beautifully. 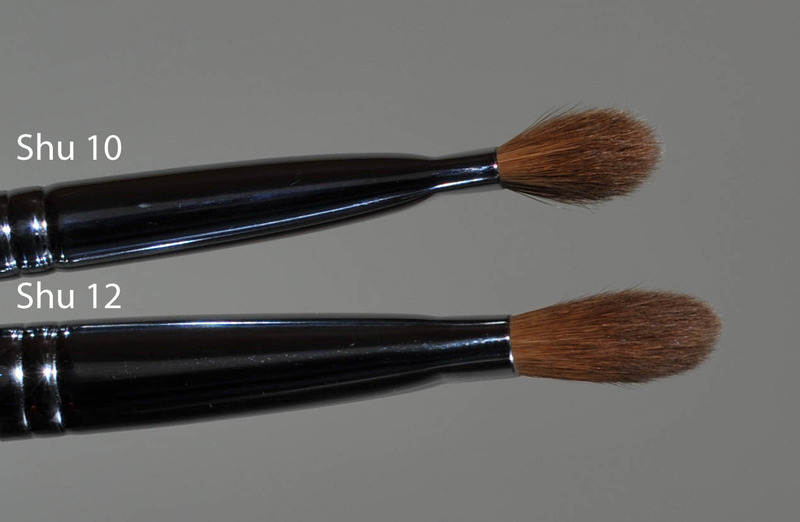 Also for the nose bridge and the temples, I think this brush is absolutely perfect for that. 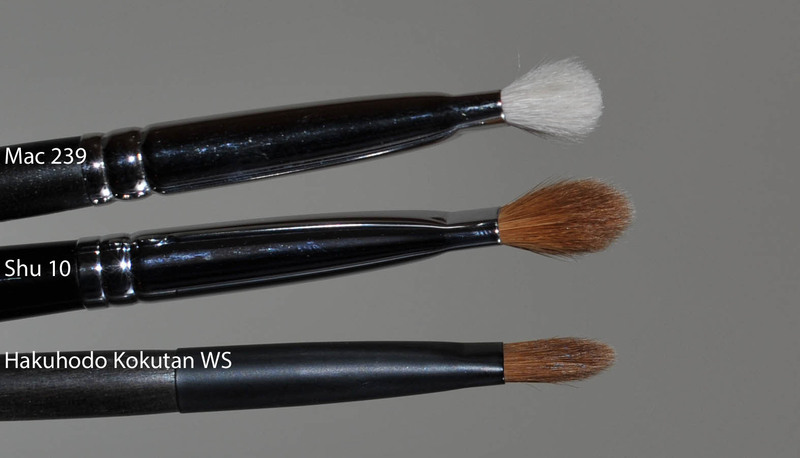 If you are aiming for a controlled crease eyeshadow application with an angled brush, then I’d rather recommend you the Hakuhodo S122, the other brushes here in the picture are more for size reference. In terms of flexibility, density and size, the Tom Ford 13 is what I believe being the closest. The Tom Ford is slightly softer and will deliver a more precise crease application. I would not pick the Shu 8HR for a defined and precise crease application since it will bring the application too high up into the browbone (unless this is what you want to do, in that case it will be fine). This brush is the reason why this review was delayed. I am still looking for “the” reason to justify this brush but haven’t found it yet. I have two brushes with this same shape, the Hakuhodo JP12 and this Shu 10F. Since the day I bought the JP12 I did not use it much, well, actually never to say the truth, so why on earth did I buy the Shu 10F ??? Probably because it’s kolinsky and I thought that it would make a difference. It doesn’t for me, this brush is not really a brush that I need but if you are looking for a flat tip brush, now you know that Shu have one. The Shu 10F is soft enough so that when you apply your shadow flat, it doesn’t hurt at all. First of all, this 5R is full kolinsky, it’s soft, although it’s dense and firm you can try to poke your skin brutally, you just won’t manage to hurt yourself. 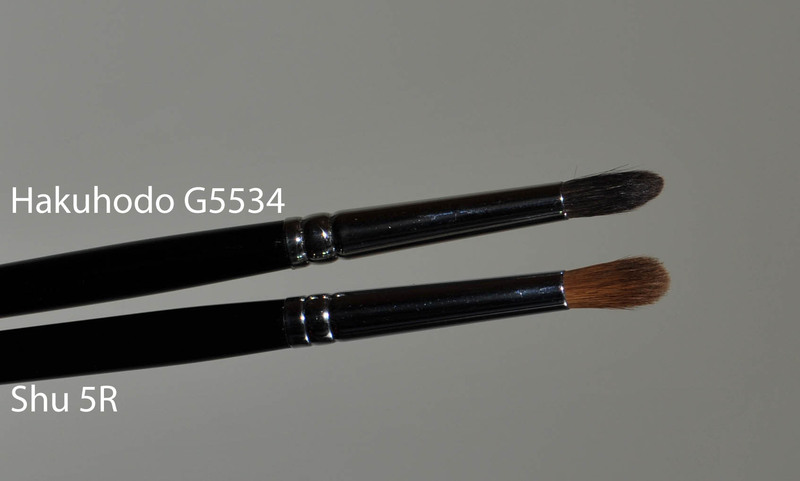 The Hakuhodo G5534 is very similar in length and width but the tip is pointier, it’s much softer and has much more flexibility than the Shu 5R. The Louise Young seems similar but as you can see it’s not, much softer and looks more like a crease eyeshadow brush. The Hakuhodo and the LY are not meant to be used with cream products unlike the Shu 5R. Again, another unique brush and of course I fell into the “oooh-different” trap. I am so glad I did. So far, I tried it with matte lipsticks, creamy lipsticks, it can handle anything. It feels like applying the lipstick with your fingertip, it’s firm and soft, you can really dose the pressure and you get precision. It gets a bit funny when you have to do the upper lip, you turn the brush upside down and there you go. 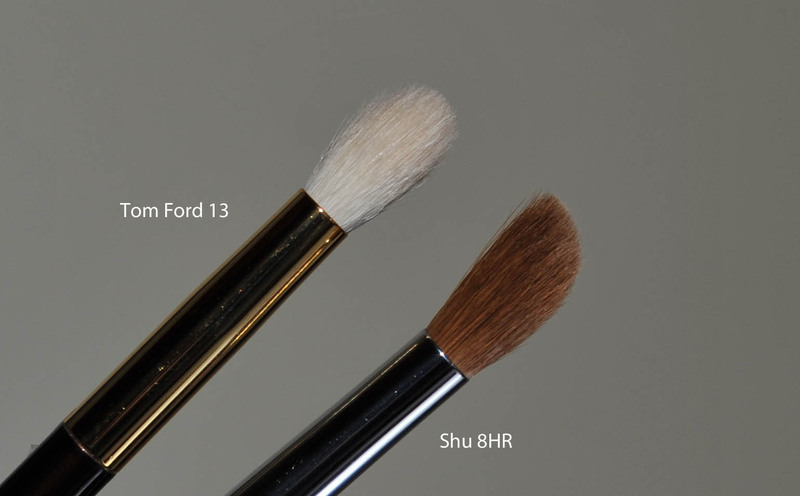 There is something special about some of these Shu brushes, they truly make you look good and feel good. I also have the tiny Shu Uemura lip brush, but it is really small therefore I don’t use it, I am more a 7H fan due to how fast I can work with it, the only problem is that it’s not retractable. The Lunasol EX N lipbrush is also kolinsky (even though I found 2 websites sites that say it’s weasel, Lunasol mentions and confirms it’s full kolinsky), it’s much thicker and also does a great job with any lipstick, my ideal brush would be a retractable and heavy brush like this Lunasol with the head of the 7H, both these brushes are fantastic. The Shu feels like applying the lipstick like a stain, same as you would do with your fingertip, but then the other side of the brush is pointed which allows more precision when you need it. Although to be honest I find it a bit tricky, the point is a bit too thin and in a way “bouncy”, therefore sensitive to movement so I need to be careful when drawing a very precise line. If I am going for a stain-application, I pick the Shu 7H, if I am going for a dark-precise-controlled application, I pick the Lunasol, but either will work. I hope these pictures help if you were looking for some information or comparisons. I think Shu Uemura is not sold anymore in the USA but you can buy their products online. There are also more online stores that sell Shu products, just make sure they are not overly inflating their prices. 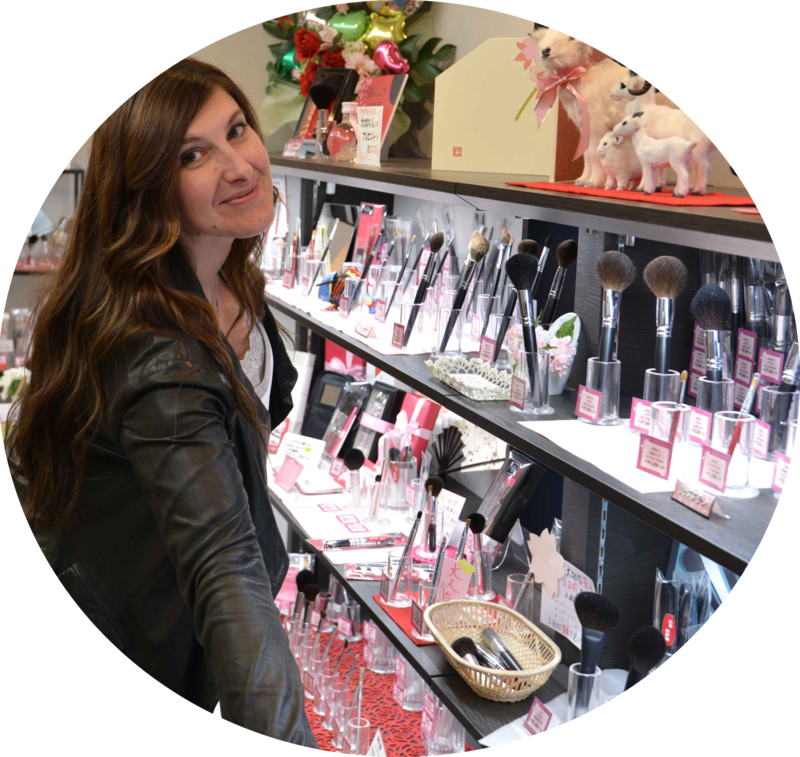 The prices may vary depending on which country or online store you buy them, but since these brushes are very expensive, you better try to find the best deal. I paid for mine myself but I always managed to get them at reduced price on special discount days. If you have any questions, please don’t hesitate to contact me ! Shu Uemura brush review : 12, 10, 8HR, 10F, 7H, 5R was last modified: September 24th, 2014 by Sonia G.
lip brush in this casing has a flat, broader but pointed tip. Beside the Shiseido Perfect Foundation Brush (erhmm, I dun use Shu 18 often cos I love it too much), it’s the other brush that I never fail to use on daily basis. I love Shu’s kolinsky and sable mixed eye brushes. The couple of blue squirrel Hakuhudo eyeshadow brushes and Lunasol eyeshadow brushes just play 2nd fiddle to Shu’s. However, I do rate Edward Bess’s luxury eye brush almost as highly as the Shu’s eyeshadow brushes. Agree with you that 8HR has higher learning curve. I am still trying to grapple with the right technique of using it. As to lip brushes, I love the Lunasol retractable lip brush, but I must try using the 7h more often. Again, thank you for your detailed review, it reaffirms my choice of choosing Shu eyeshadow brushes over Hakuhudo’s if the bristles were kolinsky or sable. oh dear… it’s an eyeliner !!! that’s why I love to share my thoughts with you, I always learn many very useful things 😀 although right now, I feel like I want to hide in a dark deep hole but I am so happy I know now why it wasn’t working as a lip brush !!! Like you I am also really wanting the 11 and some other now that I tried these, but I will wait for a nice opportunity (price) and slowly build up my natural collection (I am not very tempted by synthetic ones now that I own many Hakuhodo J Series). That’s right Amy about choosing Shu over other brands when it’s kolinsky/sable brushes, and one way to avoid wasting even more money is to go straight for the Shu kolinsky/sable instead of buying many similar ones hoping to get better results. While I truely love most Shu’s eye brushes, I regretted much my natural 4R portable brush. The elasticity of the very long sable bristles works like whipping rubber bands against my lids. Not a good purchase. I fully understand, it’s just that we want to try and feel the products beforehand, although I am quite happy with the purchases I made recently and with Hakuhodo quality I’d rather preferred if I could see them in person ! I would save a lot of money ! Just a note, I use the retractable eyeliner for tight lining only, because I still do not know how to use pencil liners, liquid liners etc. I can’t bear to use my 2R, 4F, 5F and 6OB with eyeliner gel. And all other synthetic brushes just irritate my eyes. So I find this most suitable for me… And it’s so portable. Thank you so much for the idea ! will definitely try it ! my tip for the pencil liners is that I apply the pencil on a soft brush, then I can apply it from the tip of the brush (instead of the pencil) on the lash line and I can precisely control the application and not put too much pressure or too close to the waterline, this makes my eyes look bigger and doesn’t give me irritation, I am lucky that the brushes I use don’t irritate my eyes at all, but I have to use very soft brushes for that. Same for liquid eyeliners, I do apply the product on my brushes and only from the brush tip onto the lash line. The Shu #10 & 12 are really the only Kolinsky eyeshadow brushes I like for laying down colour. As I have generally experienced Kolinsky as being too firm for packing color on my eyes, I assume that the difference between the Shu natural 10 & 12 and other Kolinsky brushes lies in the Kolinsky/ Sable mix. Both the 10 & the 12 are firm yet pliant and the slight fluffiness/ fullness/ spring, which I assume comes from the hair mix, makes them very gentle on the eyes. they are two exceptional brushes which I am very fortunate to own. For those interested in finding out more on the hard to pinpoint difference between sable/kolinsky, here’s a link to a forum discussion – albeit about paint brushes. There is also a picture of a most gorgeous little red sable. Although I use my 10 & 12 every day, I take good care of them & have had them for years. I hope they last me a lifetime as I will never again be purchasing any other Kolinsky. Buggsiebee, thanks for the link, but I am still confused and now feeling very sorry for the poor little animal shown 🙁 Maybe it is too late in the day for me. Sonia, thanks for the thorough review and great photos. Because Shu brushes are too long for me, I purchased substitutes: the Hakuhodo 133 (Canadian squirrel) recommended by Gaia NonBlonde and Chikuhodo 10-2 (kolinsky) recommended by Kate Drivel. I really like them but with testimony of undying loyalty to the #10 and #12 from Buggsiebee, I may break down and purchase. Will try to wait a little longer as Shu has offered the #10 in a travel size before and maybe will again. Had to laugh at your comments on the 10F — I do that all the time, repeat errors in hopes that this time it’ll be fantastic! When I saw that little red sable I immediately knew that I would not be purchasing any new Kolinsky brushes just to satisfy my curiosity & to experiment. I have most certainly long found my two HG brushes in the Shu 10 & 12 and so it would be inexcusable for me to cause any more suffering of theses little critters. I was looking at #10 as well, and I was reading a review by Gaia (the Non Blonde) that who compares it with Hakuhodo S133, which she prefers. Can anyone do a comparison? In terms of size and shape they are very similar, the hair layers start at the same level, therefore both brushes pick a good amount of product. The S133 is slightly thinner sideways. The S133 is canadian squirrel, which is very soft, has more flexibility than the Shu 10 but still allows a very good control. This material is not made for cream/liquid products unlike the Shu. The Shu 10 is much firmer, will deliver a slightly heavier finish, more appropriate for any type of shadows. The S133 is softer, more precise, delivers a more natural result. The Shu is firmer, works with any product, delivers a more heavy result. Thank you Sonia as always! I just wanted to say that Mac 239 was my first real eyeshadow brush purchase too! In fact, it is only one of two Mac brushes I’ve got (the other is the 188). I’ve been meaning to pick up the 217 since it’s considered an “essential” Mac brush but for some reason, I never got around to it! On another note, on the new things I picked up recently, I really am loving the KGD foundation. I’ve been playing around with the G-10 but it gets so dirty quickly, I’m sticking with my Shiseido 131 (drugstore Perfect Foundation Brush). Since it’s summer here, not that it always feels like it, I’ve taken to a little powder down my nose and I really love the Chikuhodo Pf-2 for that! It’s so cute and works so much better than a powder puff, not that I was using a puff in the first place haha. Oh if your little G-10 gets dirty quickly, try the Bobby Brown brush cleaning spray (Buggsiebee recommended it to me), I don’t use it with squirrel brushes but the goat ones, specially foundation brushes and also these Shu brushes I use it all the time and I can use my brush straight afterwards, no need to dry them completely. I am intrigued by the PF-2, I wanted to get it some time ago, can you please please please let me know if the brush is short like that or if it’s meant to be “plugged” into another handle ? I’ll take a picture for you when I get home tonight since I’m at work right now. I can email it to you so you can have a look 🙂 The handle is short though, but it’s actually perfect for its function as a pseudo ‘powder puff’. I don’t think it plugs in anywhere…wouldn’t that be interesting? To plug it in to a different handle whenever your mood changes? And then you can have gorgeous handles like the MK series! Haha, now I have images of the Pf-2 plugged into the end of a sword-like device, being brandished about as a weapon! We do have a crazy imagination here 😀 I wish we could design our own brushes and make them reality ! Since I had never seen a brush like that I did not know if that was meant to be “plugged” into another handle or if you were meant to use it like this with the tiny handle. But then came Koyudo and I saw that many brushes have little handles so it appears more normal to me. Sorry! I sent you the photo without reading this first. The ferrule base is 2.5cm, hair length about 3.5cm, full length 10.5cm. Would that be too big for blending? I love the short handles! It really is perfect for my short-sightedness and I actually feel I have better control. I am happy that some brands give both options, short and longer handles ! I got a response from Koyudo yesterday and I was just looking over the fu-pa again. It does remind me of the Fu-Pa01, although the hair shape is perhaps a tiny little more reminiscent of the Deka in a way, perhaps a cross between the two? Since the fu-pa01 is meant for powder and blush as well, they probably work in the same way so I’m not sure if you will “need” it as such! Again very helpful, Sonia. Thank you. Another thing, which might have been addressed elsewhere, I’m curious about is whether there certain generalities can be said of the degree/amount of shimmers/glitters/sparkles preserved/transferred by different kinds of brush hairs. I would guess that as squirrel hair is supposed to give matte finish, it would tend to lose shimmers with application. Could anyone say anything about how goat and/or kolinski and sable compares in that regard? And Mac 234 and Shu 10 in particular? Or does anyone know a brush that makes most of sparkles, shimmers, glitters? Many seem to think fingers work best for that (for instance, for Tom Ford Sparkly shadows, Chanel Illusion d’ombre or Armani eyes to kill, etc. on the center of the eye). Well I can give you my experience with glitter/shimmers. These kind of products in my collection involve for example : Chanel Illusion d’Ombre, Armani Eyes to Kill, Tom Ford glitter pans, sparkly shadows. Please keep in mind that I am not a professional makeup artist so my opinion is based only in my own experience with these products. The brushes and materials I love to use with these products are goat (Mac 239 for example), Shu Uemura 10 or 12 (sable/kolinsky), Hakuhodo J122R (goat/synthetic), other Hakuhodo kolinsky or weasel brushes and even goat, the main reason is that they are firm yet fluffy, you need to be able to grab a lot of pigment on the tips and put pressure while patting it, these materials are great for that. Squirrel hair is not suitable since it’s too soft and you will only be able to put little pressure while applying the product and also squirrel hair is not suitable for creamy products. For example my favorite brushes for the Chanel Illusion d’Ombres are simply the Shu Uemura 10 or 12 (for a more heavy result) or the Hakuhodo J122R for a more sheer and blended all-over application. 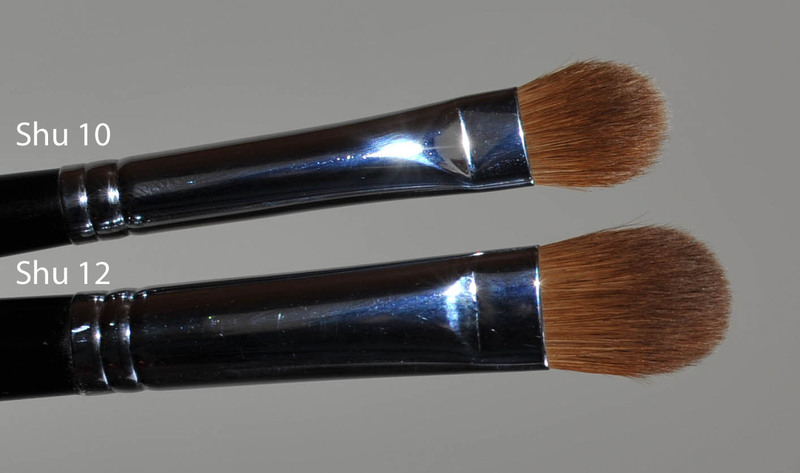 The firmer the brush, the better but it still has to be a bit fluffy for a more easy blending. The Mac 239 is also great but if you are looking for a heavier result the Shu are the ones to go for. For the Eyes to Kill, both the Mac 39 and the Shu 10 deliver a heavy application but the Shu glides better and feels even more appropriate. For the Tom Ford glitter pans (or any other heavy-glitter products) the Mac 239 is excellent (better than the Shu), I also have the Addiction eyeshadow brush in raccoon hair, great for this kind of products but I have to say that the Mac 239 does the job very good and I don’t need to use any other brush. To summarize, for very powder glittery products, goat is excellent, the Mac 239 or many Hakuhodo J goat series are great. 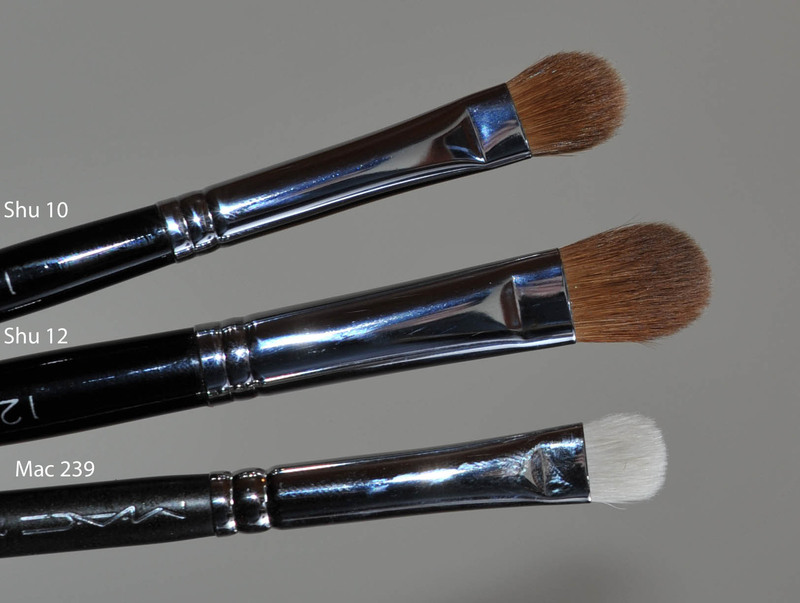 For more creamy glittery products I reach for the weasel, sable, kolinsky brushes, but the Mac 239 works very well too, my fav are the Shu brushes sable/kolinsky, they are firm yet dense and very nicely layered so they allow a perfect blending. I think the Mac 239 and the Shu 10 are must-haves, but I also think the Hakuhodo J122R is a must have if you like to work with sparkles in a “natural” way, to me it applies just the perfect amoun since I don’t like too heavy results and for creamy textures with sparkles I just love it. I recall reading that post & being quite surprised that she prefered the S133. For me the Shu # 10 wins hands down. I find the S133 too flexible. I’m not that fond of squirrel for laying down color on the lids. If I didn’t have the Shu I would rather use a goat hair brush for this purpose. It basically just boils down to personal preference though – whatever suits ones features & individual makeup requirements. Same for me, to lay down and pack color on my lid I very much prefer the Shu 10 or the Mac 239, but I have to say that I am also impressed, for a squirrel hair brush it does pack quite a good amount of color. We all have our favorites, I am also surprised she preferred the S133. I don’t have any Shuu brushes yet, but your post makes buying one very tempting! I do have a question, though not exactly related to this post. 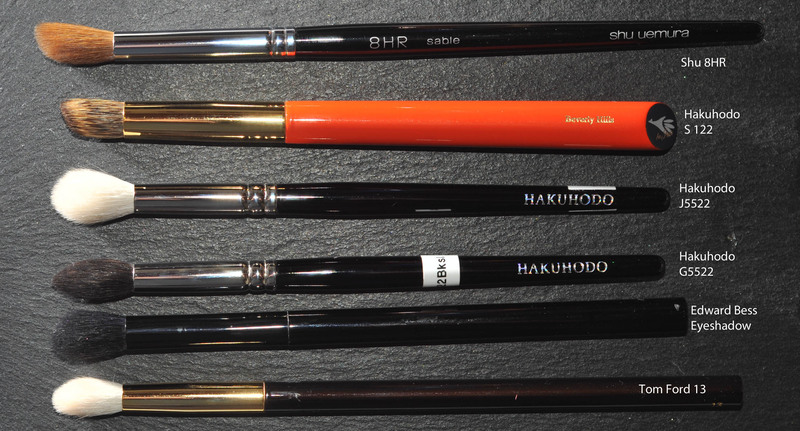 Have you ever come across a dupe from either chiyodo, hakuhodo, shu, other high end japanese brushes for the MAC 226? I find most blending brushes just too big for controlled blending, but the 226 is the perfect size and shape. What I don’t like about it is that it sheds and is feel rather rough on the eyelid. I’ve been looking for a better quality dupe for ages but haven’t come across anything similar. The Tom Ford is the one I reach for the most but if I need to place the color very precisely I would pick a smaller one first. It seems like the quality of the Mac 226 has decreased, I think the first series were slightly better (what I heard). The thing with this 226 is that it’s dense and pointy and that’s something I could not find in any other brush but mine hurts my lids that’s why I don’t reach for it. Sadly (or maybe it’s a good thing for my wallet), Tom Ford isn’t available in Taiwan where I live. Interestingly, I think I have a dupe (or a close one ) of the Shu 8HR. 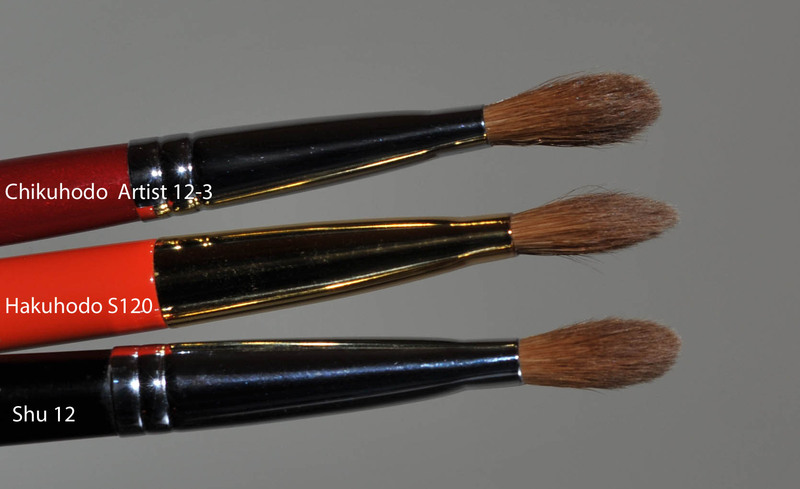 Lam Sam Yick is a local Taiwanese brush maker has a brush called the 532 that looks almost like the Shu 8Hr. It’s also handmade, and it’s sable. More info here (the site’s in chinese) and if you’re interested in a closeup picture I can send you a pic of the one I have. 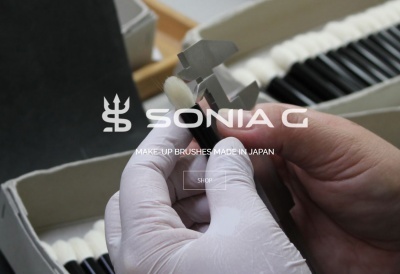 Thanks a lot for the review Sonia, I just bought a few Hakuhodo brushes so the Shu10 will have to wait : ) I will wait for a discount in the US webpage, the usually have 20%-25% off which make the brush more affordable. I have cream and powder eyeshadows so I prefer something I can use with both of them. Again, thank you Sonia… incredibly helpful!!! Billy B review will come soon, and thank you again for helping with them ! Hi, I have the Shu !0F brush and I use it for concealer. I bought it many years ago back when Shu Uemera had their concealer in a pan as the sales lady use this brush and I still use it for the Nobaru foundation sticks and TimeBalm concealer. It’s great for that kind of consistency. I’ve never tried it with more liquid concealers though but I can vouch for cream type concealers and foundations. For concealing scars and red spots, you can just dab the Shu 10F brush perpendicular to the face and the splayed ends will conceal beautifully. Thank you for sharing Orchidmyst ! Just wanted to report back on my Shu brush acquisitions. So, I asked a friend to pick up 10 and 5R from the counter in HK, and then from Rakuten/Tenso, I picked up the 12, 2R and the 4F. I am loving both the 10 and 12, they just really are superbly well-made brushes. 2R is absolutely tiny but it is perfect for a thin line of gel. I just wish the handle was a little shorter because I’m having trouble seeing what I’m drawing on my right eye when I lean in and then I poke myself because even with contacts, I’m short-sighted. I haven’t used the 4F yet, but I think that it might be something I can try Sonia’s pencil to brush liner trick with. Oh, and the 5R… workhorse. My favourite of them all! As I wait for my Koyuda order to arrive, I’m reading these posts and the comments to learn more and reduce the anxiety level. Sonia, thank you so much for high quality of your reviews and the high quality of comments your blog attracts! high anxiety level here too 🙂 my first koyudo order (sent the 21 of january) is still not here and the other two neither (but well, it’s been just a week since they shipped). I told myself I won’t order more till I don’t have my brushes but meanwhile I’m missing new excitement 🙂 Good there is Sonia’s blog. I know what you mean, Nikoleta. I’ve occupied my energy to de-potting my cream eyeshadows, setting up an FB page, experimenting with new soup recipes, really concentrating on excellence at work and reading here, of course. 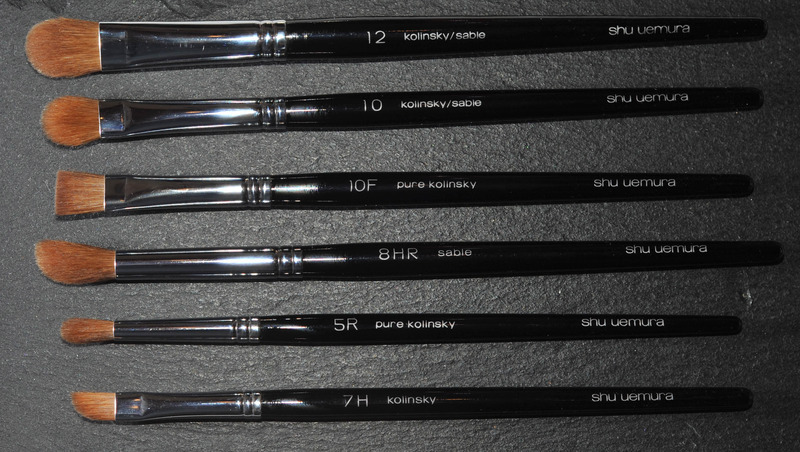 I managed to get hold of Shu 11 and 10F recently, completing my collection of Shu sable/kolinsky eye brushes. To recap, I already own Shu 15, 12N, 10, 8HR, 5R, 5F, 4R, 4F, 2R. I must say that Shu 11 has unseated my the number 1 favourite eyebrush – Shu 12. And Shu 10F is my number 2 favourite. I actually drew my first eyeliners with this. These brushes are beyond best. oh Amy, I am really targeting the rest of the brush collection, I hope I can find them in Japan ! Hi Sonia. Which one is closer to the size of the Sue Devitt full size kolinsky, the Shu Uemura 10 or the 12?